February is the American Heart Association’s Heart Health Awareness Month, emphasizing the dangers of heart disease and the importance of heart health. Heart disease includes conditions affecting the heart, such as coronary heart disease, heart attacks, congestive heart failure, and congenital heart disease. Despite dramatic medical advances over the past fifty years, heart disease remains a leading cause of death globally and the number one cause of death in the United States. 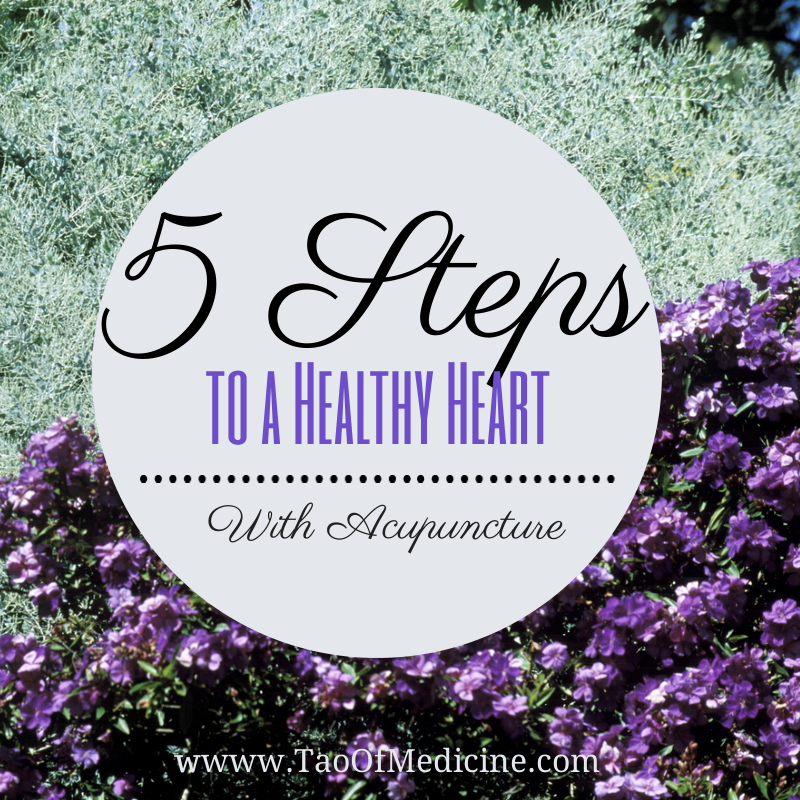 By integrating acupuncture and Oriental medicine into your heart healthy lifestyle, you can dramatically reduce your risk of heart disease. Taking small steps to improve your health can reduce your risk for heart disease by as much as eighty percent. Steps to prevention include managing high blood pressure, quitting smoking, maintaining a healthy weight, reducing stress and improved sleep – all of which can be helped with acupuncture. High blood pressure makes the heart work harder, increasing its oxygen demands and contributing to angina. This excessive pressure can lead to an enlarged heart (cardiomegaly), as well as damage to blood vessels in the kidneys and brain. It increases the risk of heart attacks, stroke and kidney disease. Acupuncture has been found to be particularly helpful in lowering blood pressure. By applying acupuncture needles at specific sites along the wrist, inside the forearm or in the leg, researchers at the Susan Samueli Center for Integrative Medicine at the University of California, Irvine, were able to stimulate the release of opioids, which decreases the heart’s activity and thus its need for oxygen. This, in turn, lowers blood pressure. Most people associate cigarette smoking with breathing problems and lung cancer. But did you know that smoking is also a major cause of coronary artery disease? In fact, about twenty percent of all deaths from heart disease are directly related to cigarette smoking. Acupuncture has shown to be an effective treatment for smoking. Acupuncture treatments for smoking cessation focus on jitters, cravings, irritability, and restlessness; symptoms that people commonly complain about when they quit. It also aids in relaxation and detoxification. Obesity is associated with diabetes, high blood pressure and coronary artery disease, all of which increase the risk of developing heart disease, but studies have shown that excess body weight itself (and not just the associated medical conditions) can also lead to heart failure. Even if you are entirely healthy otherwise, being overweight still places you at a greater risk of developing heart failure. Acupuncture and Oriental Medicine are an excellent adjunctive tool when it comes to losing weight. They can help to energize the body, maximize the absorption of nutrients, regulate elimination, control overeating, suppress the appetite, and reduce anxiety. Stress is a normal part of life. But if left unmanaged, stress can lead to emotional, psychological, and even physical problems, including heart disease, high blood pressure, chest pains, or irregular heart beats. Medical researchers aren’t sure exactly how stress increases the risk of heart disease. Stress itself might be a risk factor, or it could be that high levels of stress make other risk factors worse. For example, if you are under stress, your blood pressure goes up, you may overeat, you may exercise less, and you may be more likely to smoke. Numerous studies have demonstrated the substantial benefits of acupuncture in the treatment of stress, anxiety and mental health. In addition to acupuncture, Oriental medicine offers a whole gamut of tools and techniques that can be integrated into your life to keep stress in check. These tools include Tui Na, Qi Gong exercises, herbal medicine, dietary therapy, meditations and acupressure that you can administer at home. Poor sleep has been linked with high blood pressure, atherosclerosis, heart failure, heart attacks, stroke, diabetes, and obesity. Researchers have shown that getting at least eight hours of sleep is needed for good heart health and getting less than eight hours of sleep can put you at a greater risk for developing heart disease. Acupuncture has shown great success treating a wide array of sleep problems without any of the side effects of prescription or over-the-counter sleep aids. The acupuncture treatments for problems sleeping focus on the root disharmony within the body that is causing the insomnia. Therefore, those who use acupuncture for insomnia achieve not only better sleep, but also an overall improvement of physical and mental health. Green tea contains several powerful antioxidants that reduce bad cholesterol and boost good cholesterol, improving an individuals overall cholesterol profile. Drinking green tea also seems to enhance cardiovascular health by improving the consistency of platelets in the blood and may even lower blood pressure. Just one clove a day–or 300 mg, three times daily–reduces the risk of a heart attack at least three ways: It discourages red blood cells from sticking together and blocking your arteries, it reduces arterial damage, and it discourages cholesterol from lining the arteries and making them so narrow that blockages are likely. Make sure that cruciferous vegetables such as kale, Brussels sprouts, broccoli, and cabbage, which are a gold mine of antioxidants and other heart-saving phytochemicals, are part of your heart health diet every day. Fatty fish such as salmon and anchovies are foods loaded with the omega-3 fatty acids that will help your heart maintain a steady rhythm. Having even one fish serving a week could reduce your risk of death from a heart attack by fifty two percent. Flaxseed is one of the most potent sources of heart health-promoting omega-3 fats. Studies indicate that adding flaxseed to your diet can reduce the development of heart disease by forty six percent while helping keep red blood cells from clumping together and forming clots that can block arteries. Sprinkle 2 Tbs flaxseed a day on your cereal or salad. Studies have found that those who eat more than 5 oz of nuts a week are one-third less likely to have either heart disease or a heart attack. Just don’t overdo it–nuts can pile on the pounds. Scientific studies overwhelmingly show that a daily glass of wine can reduce your risk of a heart attack. Both plant compounds called saponins and antioxidants in the “fruit of the vine” work to protect arteries. Researchers have found that red is much more effective than white for improving heart health.